This lovely pair came to us after their owner was sadly being evicted from their home. They do need to be rehomed together as they are very bonded. Zeus and Maddie will need to go to a quiet home as only pets as they do like all the attention to themselves. They walk really nicely on the lead and have good manners. Maddie and Zeus can be shy of new people, but after a few treats and reassurance they will be your best friend. 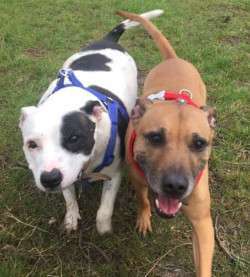 Do you have space for this lovely pair in your home and can you offer plenty of company and nice walks?